This guide is primarily aimed at Solo Queue, but I feel it is somewhat universal. Keep in mind my views are personal, may not be what works best for you, and are open to interpretation. Have fun, be nice, and set your foes on fire. 1) Try your best to always be in the back lines. 2) If you're ever alone try not to be. 3) Be able to quickly assess who can and will be able to hurt you the most in any given situation. 4) Be able to land skill shots. 5) Know how to combo abilities effectively. If you can meet all those requirements, you may be successful with one of the most fun Heroes in the game. Verdant Spheres, your trait, is what makes Kael'thas one of the most unique heroes in the game. You activate it by pressing D, and your next ability will be augmented with new powers. You will want to use this ability liberally, but a master Kael'thas player will know when to wait on its use in order to most judiciously deal out devastating combos. Increases the radius by 50% and deals 111 (+30 per level) damage. A low cooldown, but high mana cost, this ability does devastating area of effect damage. There is a rather lengthy delay and understanding when, where, and how to use this ability is essential. Is the enemy hero running away? You will need to put Flamestrike down in front of them. Are you clearing out minions? Try your best to hit as many as possible. It takes practice to land this ability properly and still hit your desired target, but it is worth it. A) There is a team fight where the enemy team is grouped. Deal 60 (+18 per level) damage over 3 seconds to an enemy, then they explode dealing 30 (+9 per level) damage to all nearby enemies. Casting a second Living Bomb on an enemy causes the previous Living Bomb to explode immediately. Has a 10 second cooldown. Makes this Ability cost no Mana and have no cooldown. Living Bomb is your primary damage ability in this build. You should attempt to always have this ability on cooldown from early game until victory is achieved. It does damage over time, and then when the DoT is over does AoE damage. Verdant Spheres makes this ability free to cast, and removes its cooldown. So, ideally, you will be casting two Living Bombs in a row for the cost of one. Should you place living bomb on the same target twice, the DoT is reset, but they will immediately explode. You will want to use Living Bomb twice on one target if you're either attempting to focus down a single target, or trying to splash Chain Bomb effectively (see Talents section below). Stun the first enemy hit for 1.5 seconds. Causes Gravity Lapse to stun the first 3 enemies hit.. Gravity Lapse is your Crowd Control ability, and it is one of the best in the game (especially when considering its effectiveness from level 1). Keep in mind this ability does NO DAMAGE and should only be used in situational circumstances, and not on cooldown. It has a short range, and a slow travel speed. In order to land this ability effectively you will need to anticipate your enemies movements. Use Gravity Lapse in order to escape enemies, effectively land Flamestrike, or set up team combos. Verdant Spheres makes it so that it will stun three enemies instead of one. It will be your least used ability with Verdant Spheres. I would recommend using it only when being chased by the enemy team as an escape, or in team fights where you know you can effectively hit three enemies. Unlike some heroes, Kael'thas drastically changes his play style based off of his level and talents. Please keep this in mind throughout the game, as how you use Verdant Spheres will change depending on the talents you choose and what stage of the game you are in. Mana Addict - A very popular choice, but perhaps a bit misunderstood. The talent increases your maximum mana by 15 for each Regeneration Globe you collect. Which means that if you collect three Regeneration Globes you can cast one extra Living Bomb prior to going back for mana. You will need to collect six for two, etc. It does not increase you mana regen at all. Combine all this with the fact that you will have to consistently over extend yourself to collect these globes, the talent seems rather sub par. But if you are having extreme mana issues and feel comfortable with your survivability, feel free to take it as an alternative. Convection - Any damage increase is generally considered a good thing, but this talent is far too situational. You have to be first make sure you hit the target with energy roll, then you need to time your Flamestrike perfectly to hit while the target is still in the air. If you're able to pull off this combo every single time, it is worth it. But I personally feel it is too niche of a talent to pick up. Energy Roil - This talent has good symmetry with Verdant Spheres. If you're going for a crowd control build this is a must have. If your goal is not crowd control, this may be a wasted talent. Fel Infusion - One of the best talents in the game, in my opinion, and highly underrated. You should be using Verdant Spheres almost constantly, so that means with this talent you will always be running at full health between fights. You won't have to worry about being ganked at half health, or going into a team fight with 25% health anymore. This means fewer returns to base, and longer sustainability. Yes, you still have mana issues, but this is one less resource you have to worry about with this talent. Mana Tap - Mana is an issue for Kael'thas, there is no getting around that. But don't look to this talent to save you from that problem. It restores mana only for enemies KILLED by this ability. Which means you need to incorporate last hitting with Flamestrike. This ability may make it easier to lane in the long run, but it highly undependable. Nether Wind - On its own, Gravity Lapse has a short range, long travel time, and is a difficult ability to land. This talent increases the speed and range of your Cc by almost half. This talent helps you stay in the back lines, able to stun more enemies more reliably, and will keep you alive. Gathering Power - Being one of the squishiest heroes in the game means that you will inevitably die, which is the major caveat of this talent. At best it is a major DPS increase, but typically it will only succeed in making you only slightly more powerful. Far better to have a consistent and reliable increase than an unreliable one. Envenom - A fan favorite, and honestly an ability that I love. Unfortunately, Kael'thas is a ranged hero. If you're in range to use envenom properly and consistently, you may be doing something wrong. It is a major DPS increase, but to use Envenom to its full potential you will have to sacrifice a great deal of your survivability in positioning. Fission Bomb - A straight up increase of 75% damage to your primary damage spell. Abandoning this talent will hamper your ability to deal damage by an exorbitant amount. Sunfire Enchantment - A moderate damage increase, but nowhere near comparable to that of Fission Bomb. You are not Valla, you can not right click to win with Kael'thas - even with this talent. Tri-Optimal - This ability goes well with Level 1 Energy Roil. If you're building a crowd control centric Kael'thas, it is a decent talent. But Kael'thas is one of the best damage dealers in the game, and the damage increase from Fission Bomb is too great to ignore. Clairvoyance - Being able to use your minimap effectively is one of the most essential skills in HotS. This talent truly does help, when used properly, to see the map more effectively and help your team have better awareness. It will also help you against ganks from Nova and Zeratul. But the damage increase from Fission Bomb is too great to ignore. Both of these talents are superb, and each has their own pros and cons. In general, I would pick Phoenix for situations where you are fighting with a well organized team that will most optimally make use of the zoning ability it has. When queuing by yourself, Pyroblast is the superior talent. The cast time is exceedingly long for this ability, but the cooldown is short and you effectively remove an enemy from the fight entirely. Play around with which feels better to you, both are fantastic options. Flamethrower - While Flamestrike has a decent range on its own, this ability puts it over the top. Honestly, I feel this increase on range (while substantial) is sub par compared to the versatility of other talents at this level. If you are just getting comfortable with Kael'thas for the first time this talent may be ideal for you, as it will help you stay out of the action while still contributing. Chain Bomb - Words fail me when trying to communicate how good this talent is. Look at Fission Bomb. Now look at Chain Bomb. Remember that if you cast Living Bomb on a target twice they automatically explode and their DoT is refreshed. This means that, when paired with Chain Bomb, you can force entire waves of enemies to explode on your whim. Verdant Spheres paired with Chain Bomb is by all definitions an overpowered combo. Take it. Pyromaniac - So why not this talent? The simple reason is that you are taking a DPS loss from not taking Chain Bomb in order to get lower cooldowns. Sure, you can cast a lot more with this talent. But you will also run out of mana much faster, so you're out of the fight quicker as well. When compared to Chain Bomb, you are losing sustainability and damage. Spell Shield - Kael'thas is squishy, and this talent might be good for new players. But you're sacrificing a great deal of damage for life with this talent. Ignite - When paired with the other talents amplifying Living Bomb, this talent becomes a no-brainer. At this level you are applying Living Bomb through Flamestrike, dealing more damage with it through Fission Bomb, spreading it through Chain Bomb, and casting it twice as often with Verdant Spheres. It may be over the top, but that's somewhat the point. If you're able to land Flamestrike with any sort of regularity then this talent will set you above and beyond your teammates in damage. Backdraft - This is a utility spell and not a damage one, and is a viable alternative at this level. With Chain Bomb you will be able to slow a great number of targets. The downside is that it offers no real DPS increase, and Ignite simply does too much extra damage to ignore. Gravity Throw - If you need more utility then Backdraft is the better choice. You're also doing so much damage at this level that you are instantly killing them anyway. Arcane Barrier - There is an argument with how well this ability pairs with Level 1 Mana Addict. But it requires pinpoint precision with timing, and has an exceedingly long cooldown to be considered a viable survival talent, in my mind. The increased damage and utility at this level in comparison is far greater than this meager shield. Rebirth - A decent upgrade to your Level 10 ability, and essentially makes it so that you have two charges of your ultimate. I find that by the time Phoenix finishes its cast the utility of it is typically over. Not to mention the inherent low cooldown of that ability. There are better choices at this level. Presence Of Mind - Players are smart. This talent assumes that they aren't. If a player is being chased by Pyroblast then they most likely will be moving away from their allies, thus negating the benefit of this ability. In addition, Pyroblast is on such a short cooldown as is. Bolt of the Storm - Another fan favorite, and a welcome addition to your arsenal. 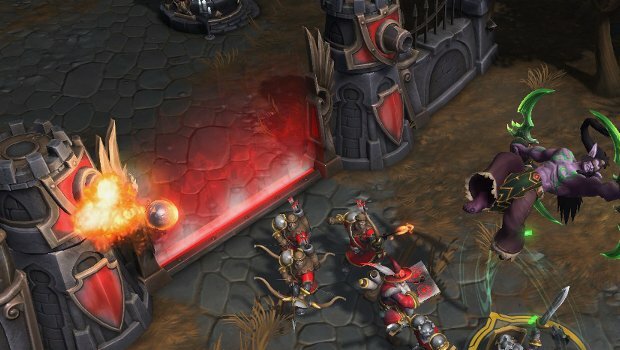 Kael'thas has a very hard time with escaping dangerous situations and this teleport helps alleviate that handicap. With the increased death timers you'll be facing this late in the game, you would be foolish not looking for new ways to survive. Arcane Power - Mana is one of the major inhibitors to Kael'thas, and thus far we have ignored nearly every talent that might help mitigate that. Arcane Power helps alleviate those mana concerns, and the increase to ability power is nothing to sneeze at. However, there is a very long cooldown on this ability and Kael'thas benefits too much from Bolt of the Storm. If you're going to be running dangerously, this may be the superior talent. With Verdant Spheres one might imagine that Kael'thas doesn't have three basic abilities, but six. Chaining combos effectively is the key to becoming a better Kael'thas player. In this section, I will expand on each viable variation in order to get the most out of your playstyle. Use Verdant Spheres then cast Living Bomb twice in a row. It is most effective to wait for that target to explode, then reapply Living Bomb so as to get the most damage out as possible. That is until Level 13 when you get Chain Bomb, where reapplying Living Bomb immediately will give you the ability to control how and when it spreads. It is also equally as viable to place Living Bomb on two separate targets that are spread out to reach your maximum chaining potential. Play around with this combo, it is your bread and butter. You will be primarily be using this combo on minion waves and mercenaries. This combo is the fastest way possible to kill minion waves early game. After placing Flamestrike on a minion wave, put your Living Bomb on the central mage. His explosion should hit each other minion, thus doing the most possible damage. This combo also can come into play in late game during team fights. If landed properly, it will spread Living Bomb via Ignite the most effectively. Switch to this combo at Level 13 when you get Chain Bomb. Verdant Spheres first, then place a Living Bomb on the center front line minion, then one on the center backline minion. Place you unempowered Flamestrike upon the central mage. This is a quicker, and more effective combo at clearly minion waves at this level due to the chain bombs. When you absolutely HAVE to get away, or HAVE to get everyone on the enemy team to stop in one place to be hit by another players AoE. This is a situational combo, and should only be attempted when you are certain it will hit at least 2. One of the problems with Flamestrike is that people aren't nice enough to stand in it for you. If you pull off this combo effectively, then they'll have no choice. Once you receive Ignite at Level 16, this combo can destroy an enemy team if pulled off. Stun three enemies with empowered Gravity Lapse, place a Flamestrike under their feet to apply Living Bomb to each of them, then cast Living Bomb on the hero in the center to set all three of them off, and spread Living Bomb to anyone unfortunate enough to be nearby. It takes skill to land this one, but it is rewarding. This is your wombo combo that will kill most heroes if executed correctly. You open up by placing Living Bomb on them twice, stun them with Gravity Throw, and force them to endure Flamestrike. This will be your primary way to assassinate, but keep in mind Kael'thas excels most when taking out multiple targets. Kael'thas does a lot of damage, but he is terrible at soloing it. He can be picked off easily if over extended, and can't take the hits from merc camps at all. But there will be times where you are assisting your allies, and it is important to know who to prioritize with your spells. When going against an enemy gate, you have two choices. You can use verdant=spheres to empower your Living Bomb and hit each tower, or you can not and put your Living Bomb on the gate itself so that the splash will hit each tower. When fighting Siege Giants I personally recommend using Verdant Spheres in order to place Living Bomb on each, then Flamestrike under them. Keep in mind that on some maps the default positioning of these mercs makes it impossible for Chain Bomb to be effective. Bruiser Camps are very difficult for Kael'thas, but by using Verdant Spheres to empower your Flamestrike will help. When you get Chain Bomb, you'll want to empower Living Bomb instead. Remember to always kill the mage first. Did you know the Dragon Knight and Garden Terror, when controlled by a player, are susceptible to many of your Hero Specific abilities? Pyroblast, Ignite, Gravity Lapse and others all are effective against them! Take advantage of this.